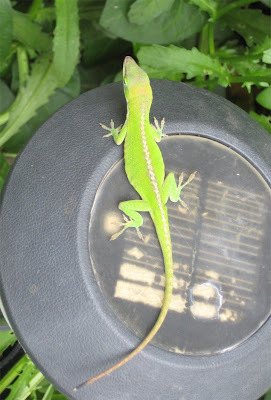 My hero, the Big Frijole Anole, has taken control of a solar-powered patio light in the garden. At first I thought he was just posing conspicuously to lure me away from my computer work for another photo shoot. His color was brown, so I figured he was kinda down. Maybe he was one of those lounge lizards who show up and start drinking hours before the DJ turns on the lighted dance floor. Turns out he'd just had a big plate of crunchy appetizers and needed a rest. 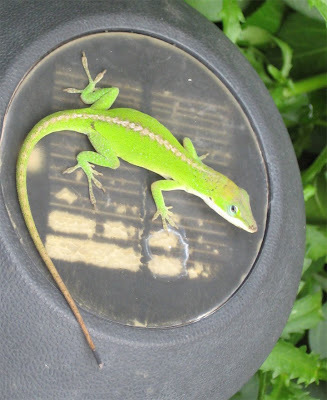 Ten minutes later he was green and actively peering out over his domain, ready to leap in any direction. Each time he jumped, he returned crunching something in his mouth, and turned brown for a rest break. The dude is the master of all he surveys! He just found another delicious white cabbage caterpillar, and I'm hearing the soundtrack for "Saturday Night Fever". That is a beautiful lizard. I guess the little light post is like a deer stand for him (a place for the hunter to wait and watch).